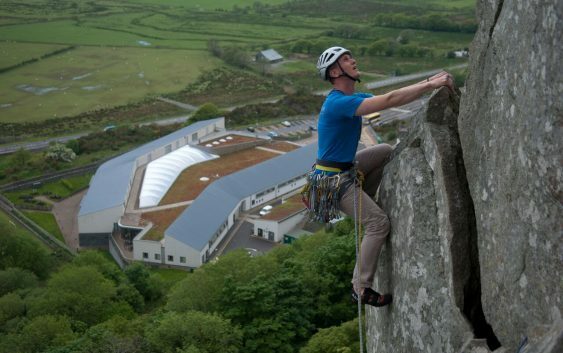 By the traditional standards of rock climbing in Wales, given that it has been at the forefront of the development of climbing since the 1800s, Tremadog is a relatively new kid on the block. As it was mainly developed from the 1950’s onwards, making it very much a post-war climbing area. The story goes that is was discovered during a snowy easter back in 1951, climbers in search of some climbable rock headed out of their usual mountain haunts towards the coast. Whilst many of those climbers got waylaid in the Gywnant Valley and Aberglaslyn Gorge, It was only a matter of time before someone found this amazing crag and started to develop it. It was inevitable as not only was climbing was starting to become more popular, there had been recent advancement and refinements to climbing equipment and finally as a result of these two things the standard of rock climbing was reaching the threshold needed to start climbing routes on these cliffs. As after a handful of VDiffs and Severes pretty much every other route at Tremadog is above that grade. Whilst Tony Moulam led the charge on developing the crags of Tremadog, he faced some invaders from north of the border in the form of J.Cunningham, P.Vaughan and W.Smith. It was this team that would create Creagh Dhu Wall, named after their climbing club that was set up for climber based in Dundee and Glasgow. It’s origins going back to the working class areas of Glasgow. John Cunningham was one of the clubs shining stars, he along with a few other notable members of the club have had many great epic adventures across the globe. The ascent of Creagh Dhu wall would barely make a footnote in his autobiography, but to the many climbers who now regularly head to the cliffs of Tremoadog seeking dry rock and sunshine when the clouds have enveloped the mountains his influence in finding and climbing this line is important, as it serves as one of the finest examples of a Hard Severe route in North Wales. The reasons for the route being so good are as many and varied as the styles of climbing you will find. The exposure and outlook are stunning for what is essentially a route that is on a cliff barely over 50m high. Add in good rock and sunshine and you have a winning combination. The first pitch starts up a steep groove with a crack in it, bridging up this and doing battle with the crack, the rock starts to rear up at you. Just as you feel the wave of gravity is going to crash down on you, you make a swerve out right onto easier ground and a long but narrow foot ledge, polished by 50 years of tentative pacing. To shuffle right along this you need to recompose and calm yourself for the delicate work ahead. Only when safely at the other side you can romp up the groove to the large tree and spacious belay ledge. Remember to get yourself into position for the main event, your mates big lead. Whoever is going to send the next pitch I can only advise that you bring an extra pair of hands and a camera because very few routes provide the belayer with what can only be described as the money shot. Although the view has been somewhat tarnished by a hospital in the field below, the outlook across Tremadog, Porthmadog and South Snowdonia is simply stunning. Often clouds dance across the high ground toward Cadir Idris whilst the light and shadows give the landscape a depth and texture that makes it more visceral. The next pitch starts by descending to a huge flake which is hand traversed as your feet dart across smears. As you reach the end and start to move up, now is the time to put on the game face, strike a pose and above all look cool; as this is going to be your new instal-face-tweet social media bragging profile photo for a while to come. Having walked the walk on the catwalk you now have to make your way up the slabby face to a small ledge, now is your time, the belayer is out of sight and you can enjoy the sights, sounds and above all the exposure, as below the flake is a series of overhangs that the route has avoided, but as a result they now add to the experience of being ‘out there’. The final crux is making your way up the polished groove to the final tree belay. A grand day out and a fantastic route. If you want to climb this route but either lack the knowledge or ability then maybe you need to consider some professional guiding or coaching from one of the areas leading mountaineering instructors. You can contact Mark Reeves via his Snowdonia Mountain Guides website.